Browse: Home /	Community Building, Community Gardens, Food, Street Gardening, URBAN FARM & GARDEN / Two FREE Herbal Workshops on August 17! Often medicinal herbs are more effective when used as a source of nutrition, than they are when used as a “magic bullet cure.” Many common kitchen herbs have been used medicinally for centuries. The line between them is fuzzy, and depending on where you stand it’s hard to see. In this workshop we will discuss the medicinal properties of some of our most common kitchen herbs, and introduce some more, that maybe you didn’t know you could cook with. As always, we are excited to hear about your experience healing through food, whether you’ve picked it up recently or it’s been passed down to you through the generations. You’re welcome to join the community meal sponsored by Brooklyn Jubilee, which is served in the gym of the Church House from 12–1pm. The community meal is part of the Flatbush Reformed Church’s emergency food program — Bread for the Journey. Are you caring for elder parents or relatives? Is your job that of a caretaker? Do you work with the elderly? Then this workshop is for you! We recognize the beautiful necessity of your work, and we also recognize that in this role you might not be caring for you. You are important! Come learn about some of the herbs that can help you create balance in your own world, as you continue to extend service to others. This workshop will help you gain a deepened understanding of a natural approach to more healthful aging. The plants you learn about will assist you in supporting and toning an aging body. Herbs are wonderful at contributing to meaningful improvement in the quality of an individual’s life. 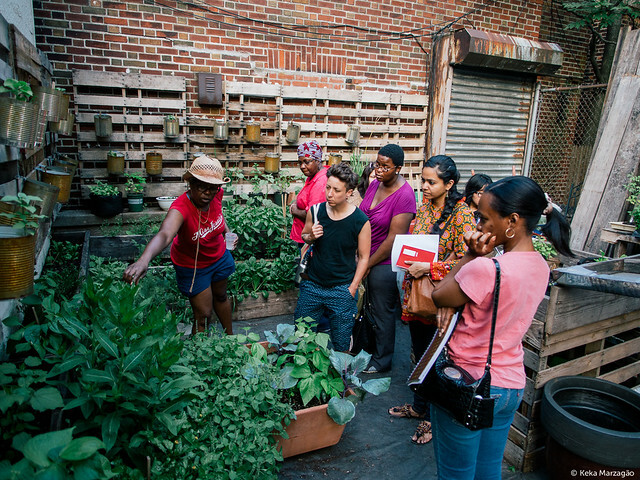 Our Herbal Workshop Series is brought to you in partnership with Sacred Vibes Apothecary, a Brooklyn-based community herbal apothecary owned by Master Herbalist, Karen Rose. Sacred Vibes guides and supports people in creating a lifestyle that reconnects them to their unique and authentic divine self. Their mission is to enlighten all to live transcendent lives through natural healing, beauty, and education. All workshops in this series will be facilitated by the apprentices of Sacred Vibes Apothecary. See you in the garden!! Every 3rd Saturday from May through November we’ll host our Garden and Compost Open House, with fun new topics and workshops each month. More about the 3rd Saturday Open House series here. Maria and Nicole invite YOU to our Monthly Volunteer Gathering! Park(ing) Day 2011 at Cortelyou Library Plaza!